This is a list of universities in New Zealand. In 2013, universities provided tertiary education to over 180,000 students or 132,553 equivalent full-time students (EFTS). 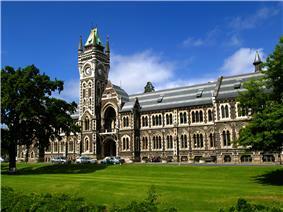 The former University of New Zealand ran from 1870 to 1961. It was a federal university composed of the six earliest universities as constituent colleges. ^ a b c "The NZ University System". Universities New Zealand. Retrieved 2014-11-08. ^ Ariel Zirulnick (2010-09-16). "New world university ranking puts Harvard back on top". ^ "We're fighting above our weight when it comes to uni rankings". ^ Indira Samarasekera and Carl Amrhein (2010-10-03). "Top schools don't always get top marks". ^ "ARWU". Shanghai Ranking Consultancy. Retrieved 2014-08-17.